Posted on May 21, 2015 by Lydia / This entry was posted in Informative. Bookmark the permalink. Here’s a little history about Head Shops! 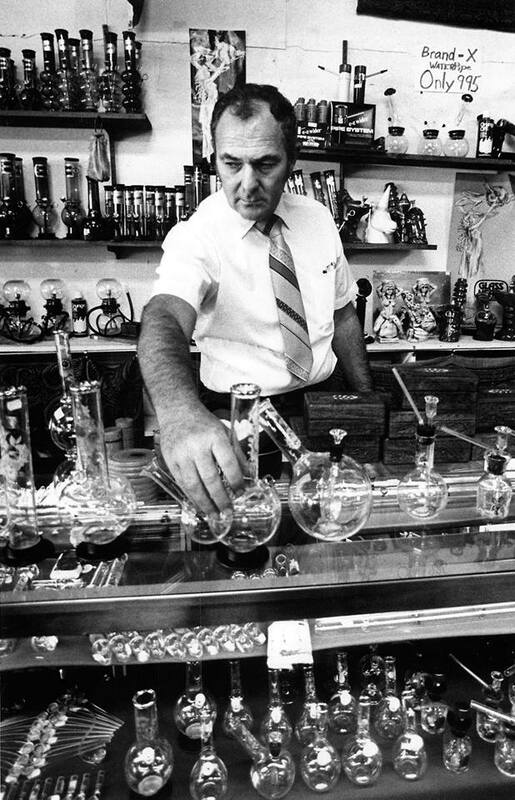 American head shops originated in the 1960s in cities with high concentrations of college-age youth, often growing out of independently owned poster or candle stores. Historically, US head shops proliferated in San Francisco’s Haight-Ashbury neighborhood, in West Los Angeles, on New York’s St Marks street, and in Chicago’s Old Town. Sources cite the Psychedelic Shop on Haight Street in San Francisco as the first head shop in the United States. Operated by United States Army veteran it was opened on January 3, 1966 by Ron Thelin and his brother Jay, Jeff Glick opened “Head Shop” on East Ninth Street in New York City a few months late. The Birmingham Balloon Company opened at 113 Fry Street Denton, Tx in 1966. Head shops served as an important outlet for underground comics and newspapers and include the rise of luminaries like Robert Crumb and other counterculture cartoonists, These artist had little access to the established channels of newsstand distribution. The shops’ popularity eventually waned with the aging of that era’s baby boomer generation, and with the retail mainstream discovering and co-opting aspects of that market niche, such as acid rock and eco-friendly products. The bottom line is you need New York city smoke shop. You have to get your training someplace. You have to be able to blow glass well enough to know all the steps and know what equipment you need, and why, and how it all works. Don’t set up a shop until you have confidence that you can blow glass safely. You should be able to blow glass at least at entry level before building a studio. My glass collecting led to curiosity to try to blow glass. The idea became more serious over time. I decided to check around and see about classes. Glassblowing is more available in Seattle or Portland compared to where I am in Oregon. In Los Angeles there also isn’t a lot of glassblowing going on, or at least it did not seem like it. Very expensive private lessons were available. A few colleges in Southern California offered glassblowing such as Santa Monica College. But I had to pass on taking the class. How do you take a semester daytime course while you are working? How do you get started in glass blowing without classes or training? Between expensive private lessons, or a class in a school setting, a class seemed to be the better option. I didn’t do either because I was working full time. I had to pass on enrolling in glassblowing class several times. To make it more elusive, the school only offered the course in the fall term due to the heat in the summer being too hot for the glassblowing temperatures. Then the news came that the company I was working for was being sold. The fortune 500 company buying us didn’t need our small accounting department any more. I decided to make a move to Oregon. I found myself between jobs, but needing to stay in LA for a few months while waiting for my daughter to graduate from college. I sold my home, rented a house, and began packing and preparing to move. The timing worked out and I was finally able to take that glassblowing class! I found myself with the time to do it at the right time of year. I was never an art major. It was scary to think maybe I was a brooklyn smoke shop or coordinated enough for glassblowing. As I mentioned before, I am an accountant. Can an accountant blow glass pipes? The inside joke was move to north to Oregon or Seattle where a lot my family had moved to, and do taxes and glassblowing and open the “glass and tax” store. It was a comical idea, yes? I wondered what is it like to make glass pieces? I was fairly mystified on how most pieces were made. How did that flower shape get inside that paperweight? I was so looking forward to glass class!